Finding brilliant wedding suppliers right on your doorstep is one of the best things about working in Kent and today we can share with you gorgeous stationery designer, Suzanne Osborne, whose studio is just a stones throw away from Wedding Dolls HQ. Suzanne launched Prettywild Design as a full-time business after working in design studios with clients including ITV, BBC and Abbey National, but she tells us “I’d always yearned to run my own business allowing me the freedom to share my ideas and love for creative event stationery”. Suzanne says “At design college, I learnt the beauty of typography, played with paper, met my future husband and graduated with a 1st! 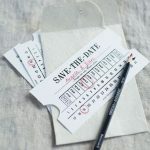 A year later we got married – it was my first wedding stationery commission. Whilst studying I had Saturday job in a local stationery shop. It was a wonderland of beautiful fountain pens, greetings cards and office equipment, with a small print division. It was an inspirational family run business and I’ll always be grateful to the owners for teaching me the importance of good customer relations, hard work and how to wrap the wedding invitation orders!”. 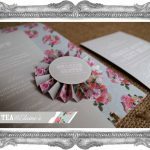 Suzanne’s stunning range of designs can be customised or she will create an exclusive design just for you depending on what you require for your event. Take a look at her website for more information about pricing and ordering. You’ll be really glad you did!